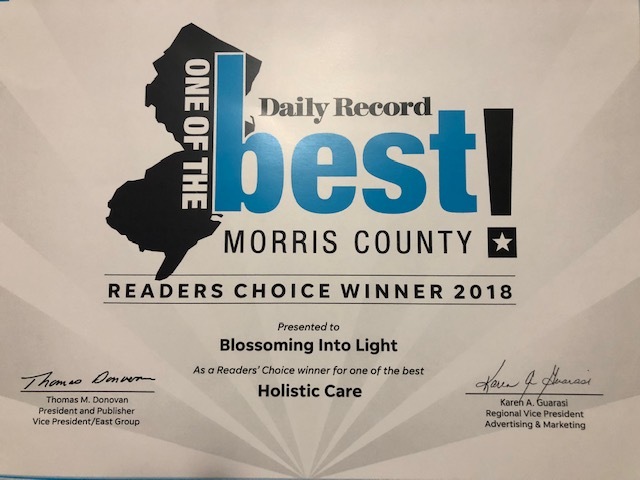 Blossoming Into Light wants to thank all of the Daily Record readers for choosing us as One Of The Best in Morris County, NJ! We have been recognized as one of the Readers' Choice winners in the Holistic Care category. We invite you to our wellness center to experience for yourself all the services and classes we have to offer. Once you come in, you will understand why Blossoming Into Light was awarded the Best in Morris County for Holistic Care. We offer classes that provide opportunities to grow personally and spiritually. We provide an array of options that assist you in opening to your highest potential. We carry specially selected items to assist you on your path.